The wife and I recently took a considerably long and disappointing walk about Omemee’s Emily Provincial Park in search of a boardwalk leading to a sphagnum island. If you’ve been paying attention, you will instantly determine whether or not we found them. Fortunately, the wife recalled reading of another possible point of interest called “The Emily Tract”. It’s literally about 1 minutes drive west of Emily Prov. on road 14 (Peace Rd), and it’s correctly located on Google Maps. There are two loop trails here, and despite some descriptions I’ve read, they’re both quite hilly. So much so, I wouldn’t advise trying either trail if there’s any chance they might be wet. There were a few natural wet spots when we were there in the early Spring, but they were easily detoured around. The loops are numbered simply 1 (marked with red reflective squares) and 2 (marked with white reflective squares). The trails are so well used that the coloured markers are just to tell you which trail you’re on. As can be seen on the trail map, there are many side trails so there’s lotsa walking to be done here. 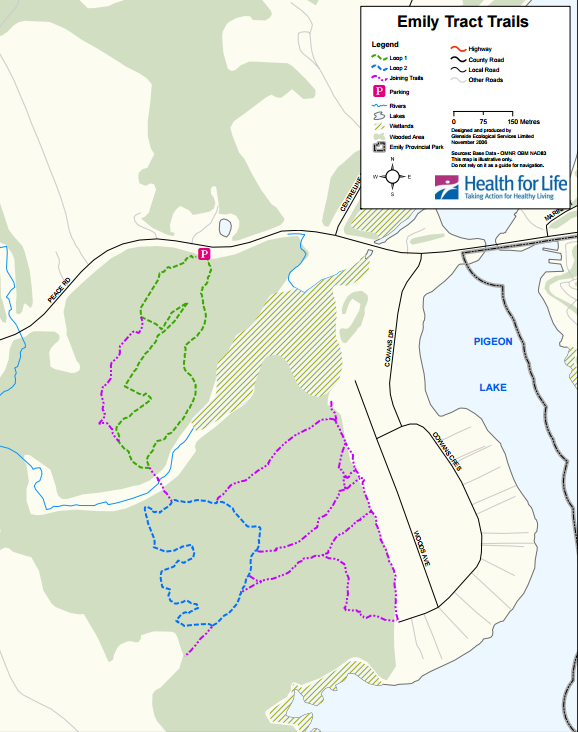 The tract is owned and controlled by the City of Kawartha Lakes, and appears to be maintained by the Advisory Committee for the Emily Tract of the City of Kawartha Lakes Forest who provide the signs of interest/explanation along the trail. Please don’t be put off by my comments on the undulating topography. These trails are in drumlin territory and calling a drumlin a hill, is understating the unique experience of climbing one and walking the crest. They’re typically steep sided and narrow along the crest. This one is particularly impressive as the top is unusually narrow and provides a view of the steep sides from one viewpoint, simultaneously. Chatten’s Creek separates the two loop trails. There are signs of recent “harvesting” of trees (as the parking area sign points out), but nothing seriously affecting the forest. We both commented a number of times on the silence. That’s something that can’t be stressed enough on a trail like this. The only sound you’ll hear are birds, and the wind in the pines. There aren’t even that many Cessna’s North of Peterborough, and Peace Rd is not a major thoroughfare. The Emily Tract is a quiet, visually appealing wander, through a wildflower carpeted forest (there weren’t many in bloom when we walked it, but their presence was obvious). There’s water, with a bridge over it (a must for the wife). The forest is well established, fairly old, and well diversified with a number of uncommon species for the enthusiast. The interpretive signs are informative, and make the walk more interesting. The topography includes a coupla steep hills, but certainly not impassable (watch it in wet conditions though). The two trails are about one Km each, and I couldn’t even guess how many Km of side trails there are. With exception of a few rare spots, the trails are wide enough for two to walk side-by-side. There are no facilities of any kind, anywhere on the trails, nor in the good sized parking area, and there’s no charge for usage. Thanks for your review. Appreciate the input. Have read a few of your other posts too. And I thank you for taking the time to comment Kevin. It’s always so encouraging to hear from readers.